"2012 CLIMATE CHANGE: A NEW NORMAL IN AMERICA?" AMBOSELI, KENYA, 29 MAY 2011: An undercover Kenya Wildlife Services (KWS) Ranger works with local villagers to detusk an elephant killed by poachers in the Amboseli ecosystem, Kenya. The elephant was killed by a single spear stroke by poachers who attacked the previous night. The elephant ran but the spear penetrated deeply enough to cause massive internal bleeding and eventual death. This under-cover ranger reached the animal at first light and to deter the poachers, the animal was detusked and the ivory sent to the KWS HQ in Amboseli National Park. KWS has the mandate to protect wildlife in Kenya but lack the manpower and resources. 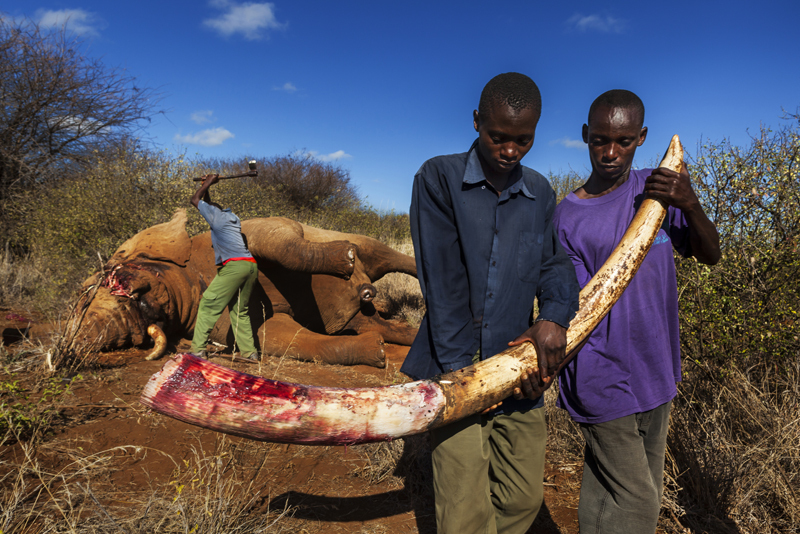 More than 25 000 elephants died for their ivory in 2011, with increasing numbers estimated for 2012.